From Steve Sheinkin, the award-winning author of The Port Chicago 50 and Bomb comes a tense, exciting exploration of what the Times deemed "the greatest story of the century": how Daniel Ellsberg transformed from obscure government analyst into "the most dangerous man in America," and risked everything to expose the government's deceit. On June 13, 1971, the front page of the New York Times announced the existence of a 7,000-page collection of documents containing a secret history of the Vietnam War. Known as The Pentagon Papers, these documents had been comissioned by Secretary of Defense Robert McNamara. Chronicling every action the government had taken in the Vietnam War, they revealed a pattern of deception spanning over twenty years and four presidencies, and forever changed the relationship between American citizens and the politicans claiming to represent their interests. 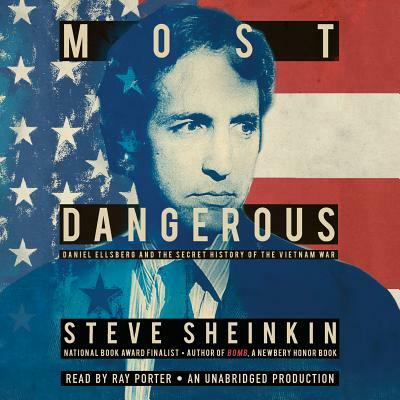 A provocative audiobook that interrogates the meanings of patriotism, freedom, and integrity, Most Dangerous further establishes Steve Sheinkin as a leader in children's nonfiction. Steve Sheinkin is the award-winning author of fast-paced, cinematic histories for young readers. His most recent, The Port Chicago 50: Disaster, Mutiny, and the Fight for Civil Rights, was included on the National Book Award Long List and received the 2014 Boston Globe/Horn Book Award for Nonfiction. The Notorious Benedict Arnold: A True Story of Adventure, Heroism & Treachery, won both the Boston Globe/Horn Book Award and the YALSA award for Excellence in Nonfiction for Young Adults. Bomb: The Race to Build-and Steal-the World's Most Dangerous Weapon was a Newbery Honor Book, a National Book Award Finalist, and winner of the Sibert Award and YALSA Award for Excellence in Nonfiction for Young Adults. He lives in Saratoga Springs, New York, with his wife and two children.